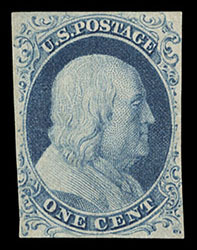 1851, 1¢ blue, type II, o.g., lightly hinged, margins close to just in, strong vibrant color, fresh and F.-V.F. 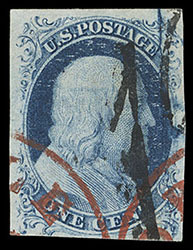 1851, 1¢ blue, type II, cracked plate variety, position 2L2 showing vertical crack completely through the right side of design, red paint Mobile, Ala. town and French due cancels, clear to large margins, rich color, Very Fine and choice, variety rarely encountered so nice; with 2014 P.F. certificate. Scott No. 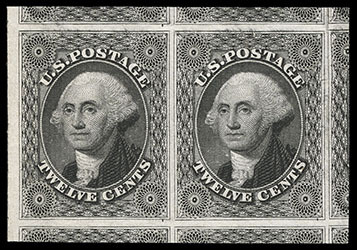 7 var. $450. 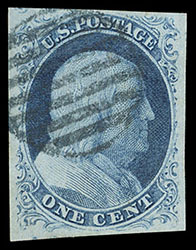 1852, 1¢ blue, type IV, large margins including portion of adjoining stamp at top, tied on small blue piece by perfectly struck "New Orleans La. Apr. 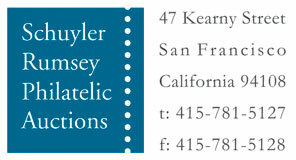 12" circular datestamp, an Extremely Fine gem. 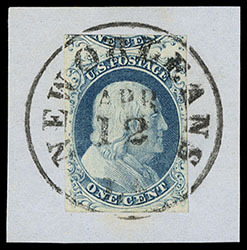 1851, 1¢ blue, type IIIa, neat grid cancel, wide margins well clear of design, strong color and impression, Extremely Fine; with 1984 P.F. certificate. 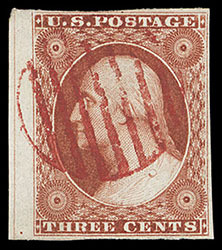 1851, 3¢ orange brown, type I, left margin single showing full centerline, red grid cancel, clear to ample margins, rich vibrant color, Very Fine, a very scarce centerline single; with 2017 P.F. certificate. 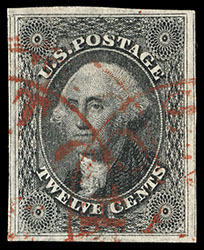 1851, 12¢ gray black, attractive red town cancels, large to huge margins encompassing portions of adjacent stamps at sides, strong color and an early detailed impression, an Extremely Fine gem; with 2008 P.F. certificate.